This page reports work in progress in understanding the five Machaeranthera taxa of southern California that have blue-purple ligules, primarily to share my results with others interested in this genus and get their feedback. This page is far from a finished project, with much still to be added. Furthermore, all conclusions presented here are preliminary, and may be revised significantly as I study these taxa further. Hence this summary currently contains none of the preliminary conclusions stated below. These taxa are treated under Dieteria in the Flora of North America treatment, as a result of recent molecular work that separates them from other Machaeranthera taxa. These two species and their varieties, along with a third species not found in southern California, have always been the problem children in the Machaeranthera genera, as demonstrated by the following comments from recent treatments. The next-to-last person to work on these species, Larry Gieschen, abandoned his Ph.D. work after several years of field and herbarium studies with the observation that The past is fiction..., quoting William Burroughs (Turner 1987). Whether he was referring to all previous work on these species as "fiction" is unclear. The latest monograph on a portion of the Machaeranthera genus, a study of five species in two sections, was written by B.L. Turner, Gieschen's advisor, after spending some six months poring over the 12,000 loaned herbarium specimens Gieschen had assembled and doing six weeks and 8000 miles of field work (Turner 1987). Turner comments that two taxa, one variety from each species, appear nearly identical to each other and could well be treated under either species (M. asteroides var. lagunensis in southern California and M. canescens var. ambigua in north-central Arizona and adjacent states). Their geographical range was used to assign them to species. Turner comments that if one chose to treat one of these varieties under the other species, it would result in all three species being combined into one. The Jepson Manual treatment comments that the two species in southern California are perhaps not different species. In Fall 2008, I tried to determine plants growing just northeast of Anza in Riverside County, and found these plants did not seem to match their voucher determinations of M. canescens var. canescens, nor did they resemble other plants of M. canescens var. canescens that I've seen in the San Bernardino Mountains. As a result, I embarked on a campaign to quantitatively analyze these taxa in southern California, which apparently has not been done previously. The elevation contours on this map are in meters. See also unlabeled map. One plant was measured at each of the eight circled locations, with the exception of one location in the Santa Rosa Mountains where only head measurements were made. Four to five heads were measured on that plant if it had that many heads in full bloom; otherwise additional plants at each locations were used to obtain the head measurements. I concentrated on gathering head data since the discrimination of var. ziegleri is primarily on the head characteristics. A Santa Rosa Mountain population along the Santa Rosa Mountain Road, at elevations of 6500 to 8300 feet, present only in the pine forests. Plants at four locations were measured from each population, a total of eight locations (including the single location in the Santa Rosa Mountains where only head measurements were made). This histogram was made with GPS readings of elevation. It will be replaced in the future with a histogram made with elevations from the USGS topographic map. Plants in the Thomas Mountain Population were mostly tall, very robust plants, some with 35-45 stems coming from a single base. Their involucres were mostly hairy, with ~sessile glands only on the inside of the phyllary tips. 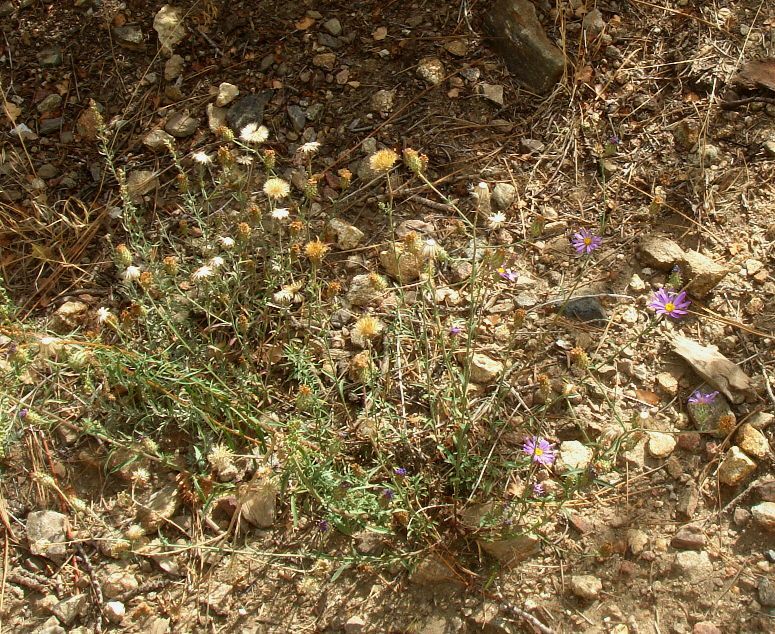 Plants in the Santa Rosa Mountain population were distinctly shorter on average, and typically had just a few stems coming from a single taproot. Despite their reduced stature and robustness, and higher elevation, they had larger flowers, with their phyllaries densely covered with stalked glands. Analysis of data collected in the field showed that these two populations separated on almost every measured characteristic: number of stems, stem height, involucre size and hair / gland characteristics, head size, and ligule size. Leaf size was the only characteristic that didn't show a clean separation of the two populations. Since the type specimen for M. canescens var. 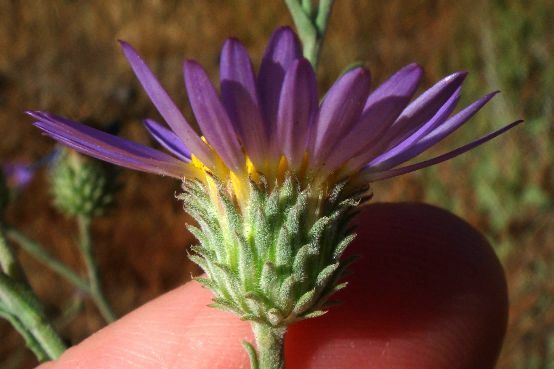 ziegleri comes from the Santa Rosa Mountain population, this population is clearly that taxon. However, this population has some characteristics that differ from what has been reported in floras, probably due to floral reports being based on a very small number of vouchers. See Comparison of Measured Characteristics for M. canescens var. ziegleri to Previously-Reported Values. The determination of the Thomas Mountain Population is unclear, except that these plants are definitely not M. canescens var. ziegleri. There are seven vouchers reported online from this area; six of those vouchers are determined as M. canescens var. canescens, with the seventh voucher only determined to the species. However, these plants appear very different from specimens of M. canescens var. canescens in the San Bernardino Mountains. For this analysis, Michael Charters kindly sent me four plants from the San Bernardino Mountain, from the South Fork Trail Area of the San Bernardino River to include in the analysis. The plots below indicate that those San Bernardino Mountain plants appear to be a different taxon than either of the two populations surveyed here. The SnBr plants are much smaller, less robust plants, being ~1-2 dm high compared to the 7-19 dm TM plants, with many fewer stems on average. The leaves of the SnBr plants are smaller. 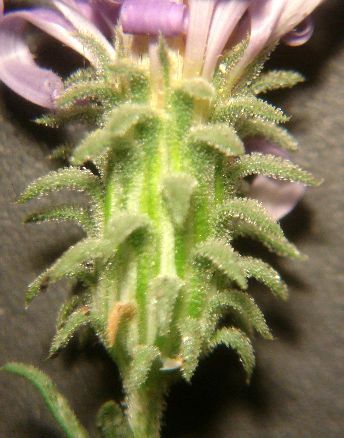 The involucres of the SnBr plants are moderately glandular, whereas those of the TM plants are almost entirely canescent. The SnBr plants have fewer ligules. The pictures of the SnBr plants by Michael Charters show these heads have 7-17 ligules, with a median of 9-10 ligules. Using four heads from pix from the survey reported here, the heads of the TM plants have 20-26 ligules, with a median of 24-25 ligules. The ligules of the SnBr plants are larger in size, despite the plants themselves being smaller. A possible determination for the Thomas Mountain plants is M. asteroides var. asteroides, or perhaps var. lagunensis. 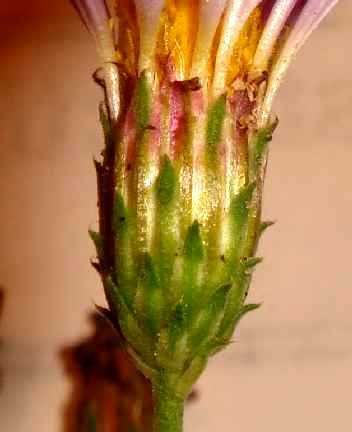 The almost complete lack of glands on these phyllaries except for the inside of the tips seems consistent with that species. I intend to measure samples of M. asteroides var. lagunensis in the near future to see how consistent these plants are with that taxon. Measured heights of the four sampled plants range from 1.9 to 4.8 feet (7.5-19.0 dm). This vastly exceeds the maximum height reported in the Jepson Manual for either species, of 10 dm for M. asteroides and 5 dm for the M. canescens varieties in southern California. 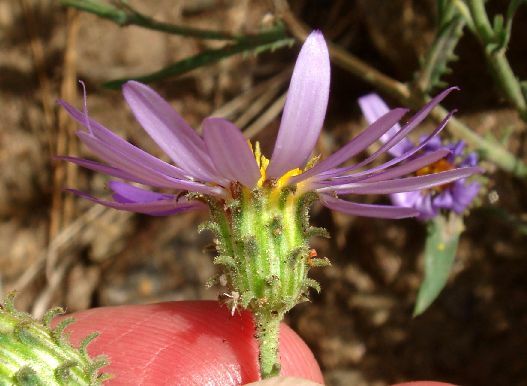 Although there is no explicit scale in the above picture, one can easily see that this plant is much smaller than the previous plant by using the flowers as a scale. Measured heights of the four sampled plants range from 1.0 to 1.8 feet (3.9-6.9 dm). This range is quite different from the 1-5 dm for M. canescens var. ziegleri, but I did see a few plants as short as 1 dm. This plant is smaller yet. See also Michael Charters' additional pictures of the SnBr plants. Note the two previous year's stems still attached to the base, with others lying on the ground nearby. Note the dead plant at left. The plant on the right has much shorter stems this year than the previous year, possibly indicating it was a biennial that survived a third year. These involucres are shown at the same scale; both are 11 mm in height. The involucres from the Thomas Mountain plants are almost entirely canescent on the outside, with at most a few scattered sessile glands. The inside of the phyllary tips are fairly dense with sessile glands. In contrast, the involucres of the Santa Rosa Mountain plants are densely glandular with stalked glands nearly everywhere. 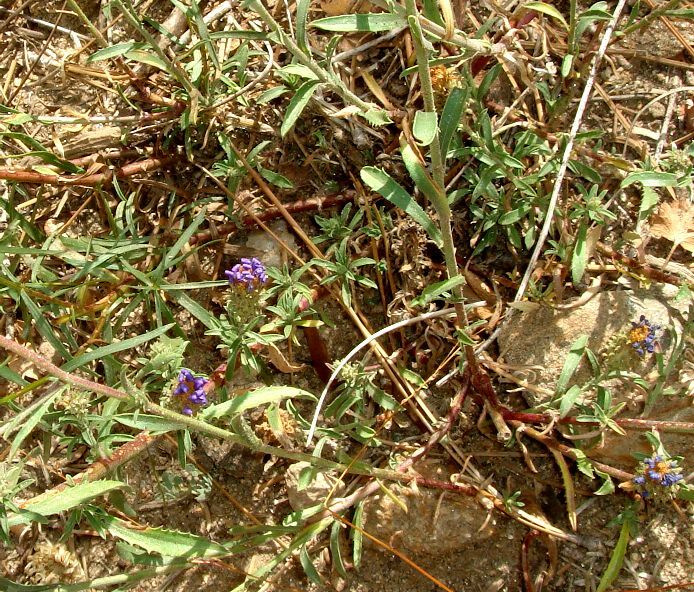 These pictures are not to the same scale; the involucre of the San Bernardino Mountain plant is 9 mm compared to the 11 mm of the Thomas Mountain plant. 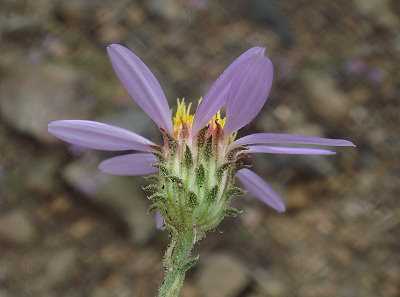 The involucres of the San Bernardino Mountain plants are somewhat stalked-glandular, without the many canescent hairs of the Thomas Mountain plants. The following plots show the characteristics measured on the sampled plants, including the single specimen from the San Bernardino Mountains (SnBr), with one head per plant included in the analysis. Subsequent plots show the measurements from all measured heads. In the following plot, only the exserted portion of the ligule was measured. The differences in the Santa Rosa Mountain and Thomas Mountain populations shown in the previous plots and pictures are so striking that further analysis almost seems unnecessary. However, in order to see how these two populations compare with the San Bernardino Mountain specimens, all of the above measurements, scaled by the standard deviation from all specimens, were analyzed by Principal Components, with the results in the next plot. One of the San Bernardino Mountain specimens was excluded from this plot due to the lack of leaves at flowering time. The center of the Santa Rosa Mountain population separates from the center of the Thomas Mountain population in PCA1 by 4.5 standard deviations, a huge difference from the ten measured characteristics. The center of the San Bernardino Mountain specimens separates from the center of both populations by about 3 standard deviations in PCA2, as well as with additional separation in PCA1. This is also a very significant separation, indicating that this population is distinct from either of the surveyed populations. Although one member of the Thomas Mountain population approaches the San Bernardino Mountain population, this closeness, or even overlap at the edges of the populations, is expected due to population variability. Such closeness does not mean that specimen is the same taxon as the San Bernardino Mountain population. In particular, the involucres of that specimen differ dramatically from those of the San Bernardino Mountain specimens in their hairs and glands. All three populations appear different. 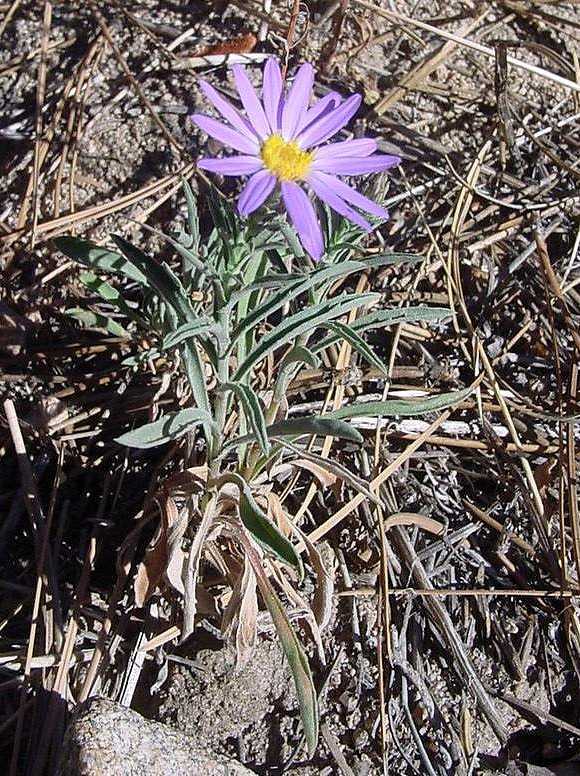 The single head from the San Bernardino Mountains that falls within the Thomas Mountain plants was the last blooming head on that plant, which often are atypically small. The next plot shows that the relationship of the involucre and head length of this specimen differs from the relationship in the Thomas Mountain plants. In the above plot, only a single head from the Thomas Mountain population overlaps with these characteristics from the Santa Rosa Mountain population (note that its plotted point, a filled blue triangle at an involucre length of 10 mm, is mostly hidden by the filled pink rectangle in the plot immediately above). The measurements from this head are the most extreme of the field-measured values when the length of the head is compared to the square root of the sum of the squares of the involucre and half-head width. Its length is 1.35 times that value, whereas a typical head has a length 1.1 times that value. This indicates either that the geometry of this flower was unusual, perhaps caused by the ligules not being fully open, or that one of my measurements in the hot sun was incorrect. Habit. The defining paper for this taxon (Munz 1969) simply says it has the habit and vegetative characters of M. canescens var. canescens, which Munz (1974) says is a tap-rooted biennial or short-lived perennial. However, the Jepson Manual reports this taxon as being a long-lived per or subshrub and the Flora of North America calls it a subshrub. I found no evidence that these plants are subshrubs. 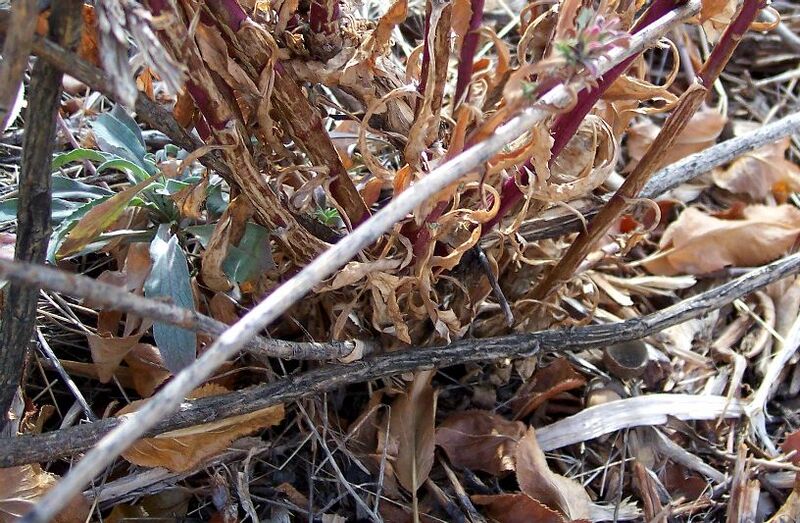 The Thomas Mountain Plants have much more evidence of a woody base than do these Santa Rosa Mountain plants. Habitat. Along the Santa Rosa Mountain Road, these plants occurred only in the dry coniferous forests as reported in the Jepson Manual. This is the same as the Pine forests in the Santa Rosa Mountains as reported in the Flora of North America treatment. Elevation Range. These plants ranged from 6560 to 8240 feet, compared to our survey elevation range along the Santa Rosa Mountain Road of 4600 to 8240 feet. This is an extension to higher elevations for the range of 6500-7500 feet reported in the defining paper. Plants may occur at yet higher unsurveyed elevations up to the maximum elevation of 8700 feet at Toro Peak. The Jepson Manual reports an elevation range of 1400-2470 m (4600-8100 feet), similar to the range of 1400-2500 m (4600-8200 feet) reported in the Flora of North America. Both floras give a much lower value for the minimum elevation than found in this survey. I suspect this lower value of 4600 feet is incorrect, from the following. There is only a single online voucher from an elevation below 6500 feet - RSA219228, from Peninsular Ranges: San Jacinto Mtns region Along road to santa Rosa Mountain; elev. 5000 ft. There is no pine forest anywhere close to 5000 feet along the Santa Rosa Mountain Road. The plant community at essentially all elevations below 6500 feet along that Road is chaparral, unlike the habitat for this taxon. 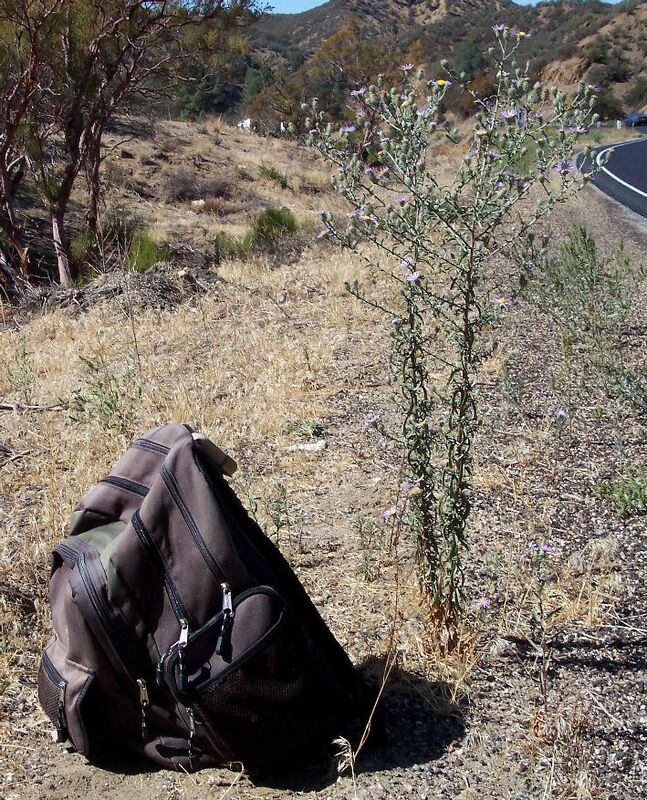 Furthermore, the survey reported here found no Machaeranthera plants at all on the Santa Rosa Mountain Road below 6560 feet, despite a very careful survey at those elevations which found numerous smaller, less visible Lessingia filaginifolia plants. Thus if this voucher is correctly determined as var. ziegleri, I strongly suspect the elevation of this voucher is in error. Alternatively, the voucher might be misdetermined, and the location might actually be from the Thomas Mountain population at 5000 feet along SR74. This location might have been considered by the collector to be part of the Santa Rosa Mountain Road, since it was "along the route to Santa Rosa Mountain". Stem height. Measured heights of the four sampled plants range from 3.9-6.9 dm. The maximum height is thus significantly more than the 5 dm reported in the Jepson Manual. Involucre length. The defining paper says that the involucre is 14-15 mm high instead of the usual 10-12 mm for var. canescens. The Jepson Manual gives the same value. 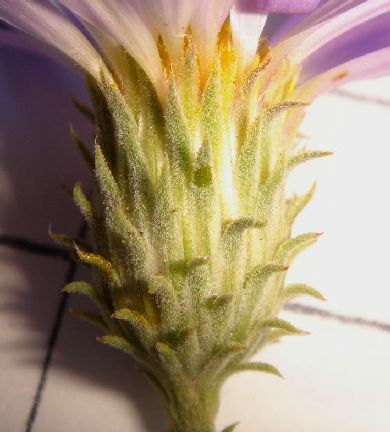 The Flora of North America gives the involucre length as (10-)12-16 mm. I found involucre lengths of (10)11-12 mm, at the very bottom of the range given in the Flora of North America treatment. This may be the result of the very dry year of 2006-2007, with the normal rainfall year of 2007-2008 not compensating for that drought year. 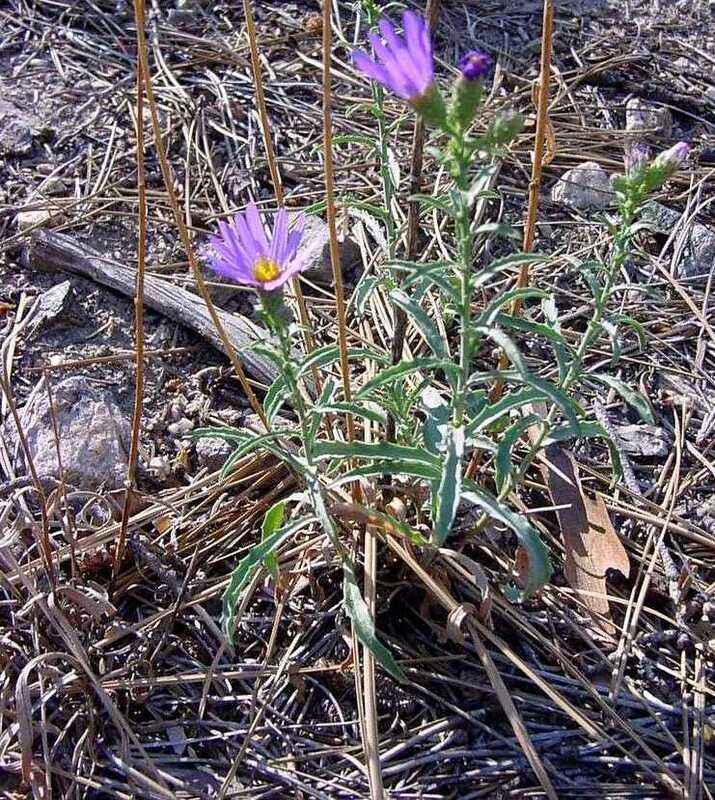 The involucre lengths for these plants were significantly longer than the 7-10 mm of the Thomas Mountain plants, and the 8-9.5 mm of the San Bernardino Mountain plants. Head length. Only the Jepson Manual gives a head length and width, of (12)14-20 mm, 15-20 mm wide (when pressed). These measurements both are undoubtedly from pressed dried plants, and so cannot be easily compared to values from fresh flowers. Values for fresh flowers when the ligules are fully spreading are 20.5-28 mm for the length, measured from the bottom of the involucre to the tips of the ligules, and 27-43 mm for the width. I'll measure values from vouchers in the future for comparison. Phyllary glands. I observed the phyllaries to be densely stalked-glandular, exactly as reported in the defining paper and in the Flora of North America. Voucher data provided by the participants of the Consortium of California Herbaria (ucjeps.berkeley.edu/consortium/). I thank Anne Kelly for help with the 27 September 2008 Santa Rosa Mountains survey, and Michael Charters for kindly sending me samples from the San Bernardino Mountains.